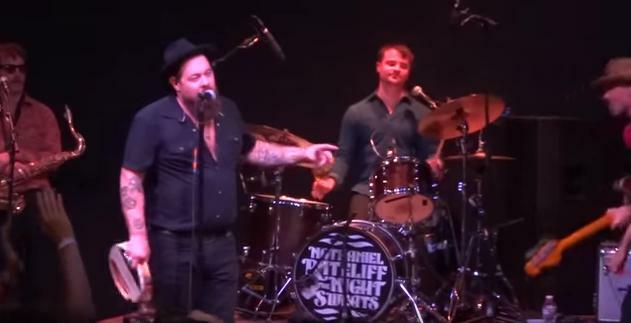 To say that Nathaniel Rateliff’s LA show was a hot ticket would be to put it mildly. Originally slated for The Echo, the concert was relocated to The Regent Theater in downtown LA to handle a larger sold-out crowd. A few short weeks had passed since Nathaniel and his Night Sweats broke the buzz meters with their Jimmy Fallon performance. The throng was psyched for this show, with a huge roar going up when the band took the stage. With the crowd knowing what the band are capable of, the set delivered on its hype. The guys are tight and they have a good time. Nathaniel surprised the country with his slick dance moves on TV, but those moves were more limited through the course of a full show. Their “S.O.B.” radio hit started to blow up after Fallon, and the band wisely saved it for the set’s final tune. Yes, they nailed it and when the band left the stage a recording continued with drums and the “oh oh oh oh” hook the song is known for. With the crowd singing along, fists pumping, the band returned and in the same tempo broke into their cover of The Band’s “The Shape I’m In”. What happened next was masterful. Nate Rate and his gang hit us with a reprise of “S.O.B.” without skipping a beat. One of the most effective encores I’ve seen in ages. Almost the entire set scored, and a personal fave was their “Howling At Nothing” from the band’s self-tltled August album. There was a slight momentum loss about two-thirds into the set. I turned to a friend and said what they really needed at that moment was an uptempo-super familiar cover that highlighted their stellar horn section. What came next was the opposite, a slower track that didn’t resonate. Of course the show ended with a tremendous bang. “Nate Rate” are blowing up in a hurry and only a few minor adjustments are required as they play larger and larger venues.